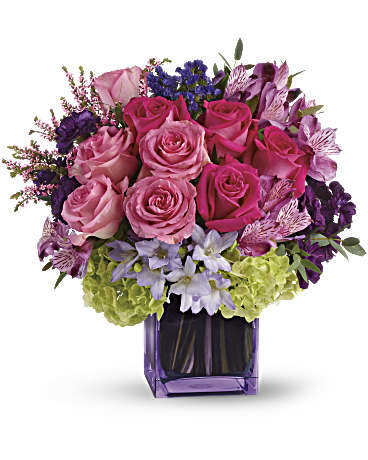 This exquisite mix of feminine blooms is like a breath of fresh air! Sweet pinks and purples are contrasted with a modern burst of fresh green hydrangea, and finished off with a pretty lavender cube vase lined with a tropical aspidistra leaf. It''s a fun pick-me-up to send anytime, anywhere! Presented in Teleflora''s lavender glass cube lined with aspidistra.